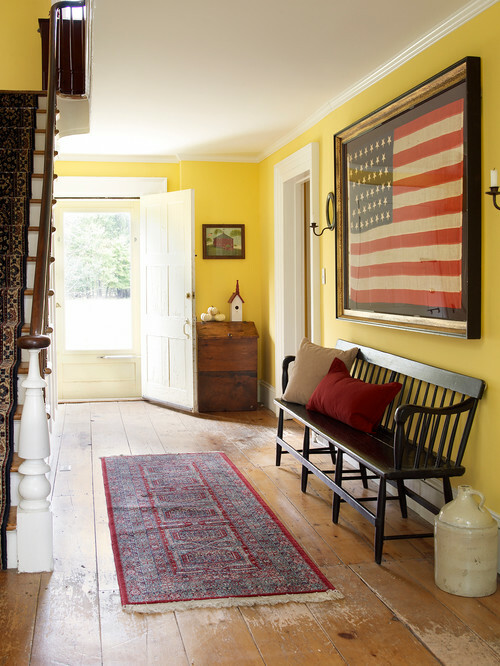 I’m excited about today’s charming home tour because this vintage farmhouse exemplifies all that I love about older homes! And it starts with the six-over-six windows, clapboard siding, and unique windows above the back porch. “They don’t build them like this anymore,” is a phrase you frequently hear about older homes, and it’s so true. 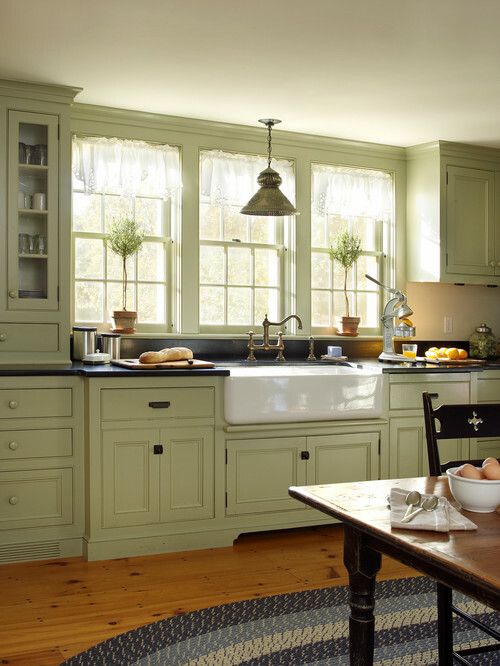 The artistry and craftsmanship that went into constructing a vintage farmhouse is so beautiful. Gorgeous wide-plank wood floors set the stage for many a historic home. Windows in older homes might be drafty, but I love that each pane is usually a separate piece of glass. In newer homes, the look of mullioned windows is created with a plastic insert placed over a single pane of glass. It’s just not the same. The kitchen windows above the farmhouse sink let in plenty of natural light. I’ve been searching for a pendant light to hang above my sink, and I like the looks of this one. Purchasing an older home gives you an economical option for enjoying custom built-ins like this butler’s pantry. Today it’s expensive to add custom elements like this to a new or existing home. 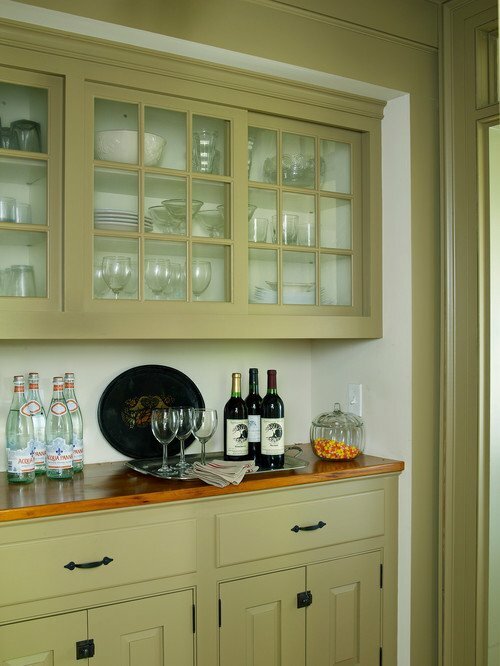 The cabinetry details are exquisite – did you notice the hardware on the lower cabinet? 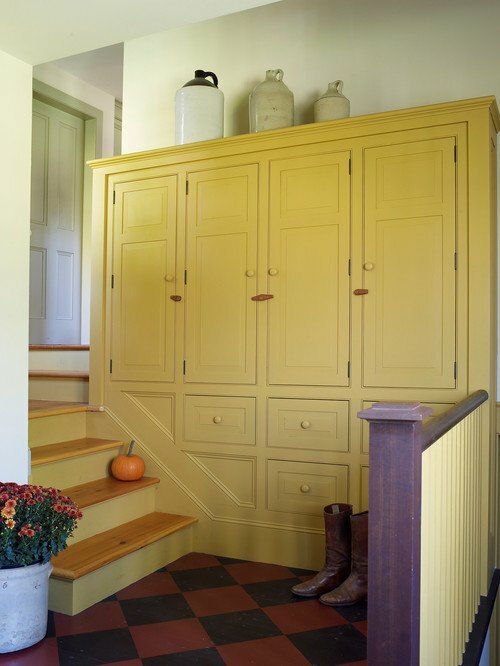 I would much rather have a piece of cabinetry like this sunny yellow one to hold dishes and such, as opposed to a walk-in pantry. The checkerboard floor is a whimsical touch. 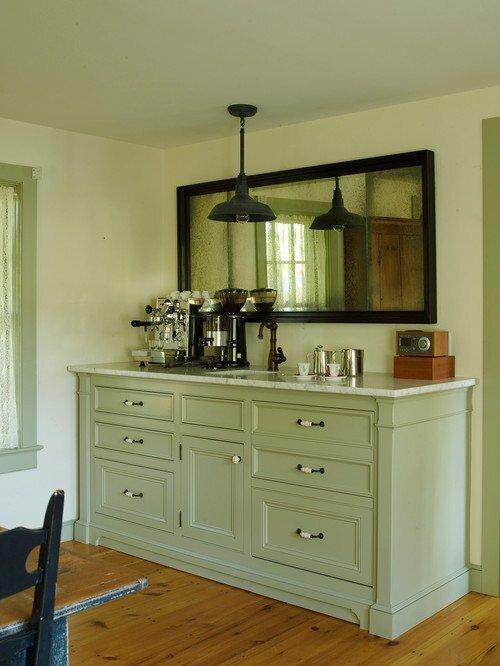 A built-in credenza creates a cozy space for a coffee bar in the vintage farmhouse dining room. A vintage radio adds its own charm to the space. Walking through an older home always makes me wonder about who built the house and how the first family lived there. You can always feel a certain vibe about the interior spaces. See those snowshoes hanging on the peg rail? I’ve asked for a pair like that for Christmas this year. 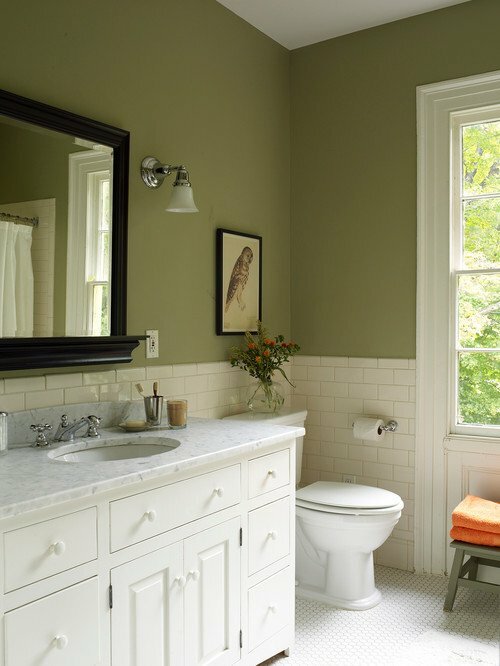 The bathroom has been updated with a newer vanity and lighting, but you still get the charm of the large window. The owl print reminds me of the owl printable I featured earlier this fall. 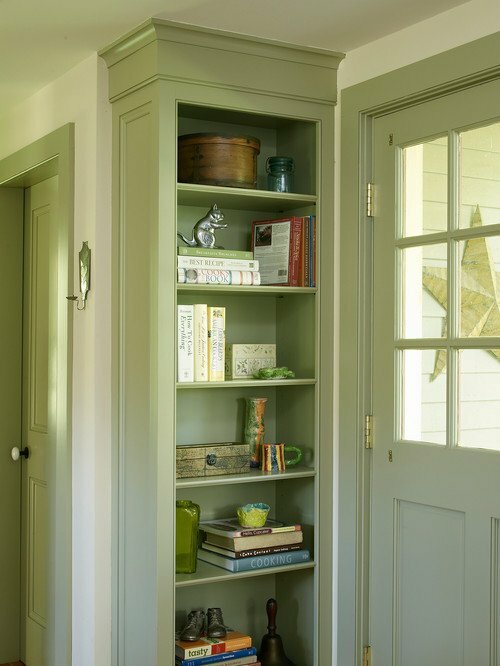 I love paneled, painted doors, bookcases, and all types of nooks and crannies you see in older homes. In new construction, you have to pay the upgrade fees for architectural details like this. 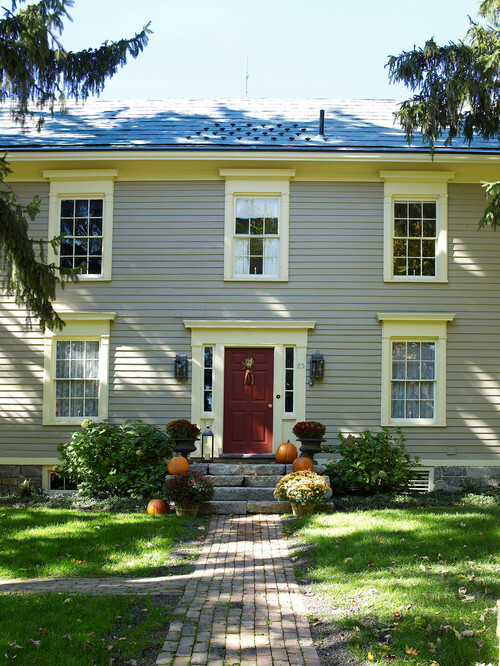 Did you know that in early America a red door signified that the home was a safe place for travelers? We all have our own taste when it comes to the home we choose to live in. I tried living in new construction once and hated it – but that’s just me. I’ll always choose the warmth and soul of an older home. 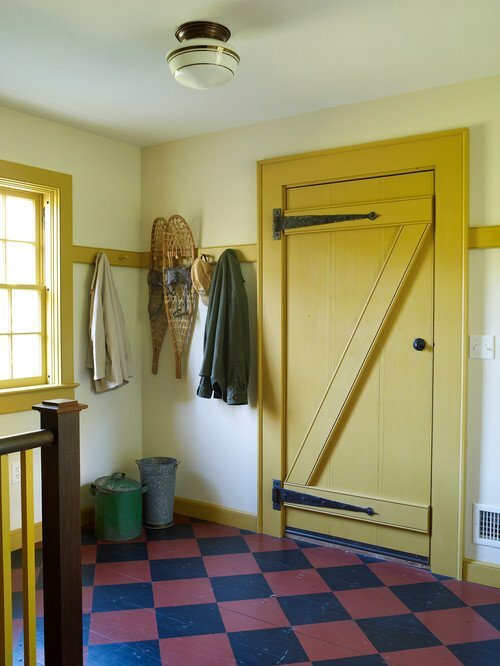 You can see more of today’s vintage farmhouse by DeGraw & DeHaan over at Houzz. Beautiful home! You are so right about how expensive it is to add into a home the features that were just practicalities 100 years ago. I really loved the framed American flag and the cross cutouts in the dining chairs. Thanks for sharing. I too love older homes. I miss the one I lived in for over 30 years. I now live in a newer home and spend my time trying to make it feel older and vintage. 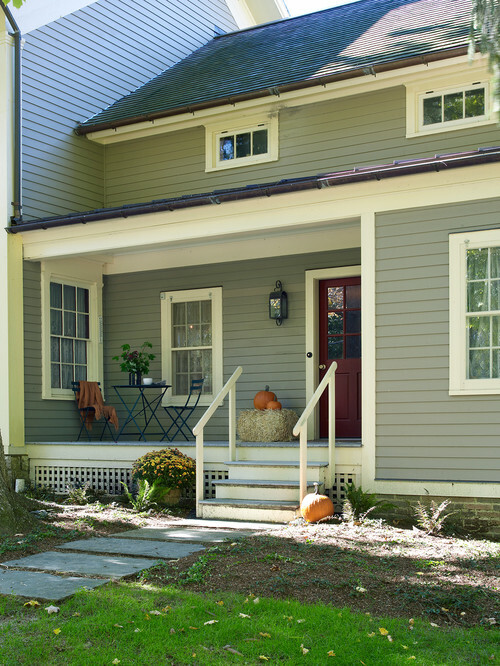 You just can’t duplicate the solid feel of an older home and all it’s quirks and character. I would have loved to have a really old home, mine is 1958. My parents had an older house 1890, i loved it but they sold it and moved to a smaller one, my mom’s health. I have a lot of old pictures of it, those built-ins and trim. i love your house, you have done a great job with it. Just beautiful- I love it! I lived in some of those older homes. The are beautiful…..many memories. That is a beautiful home. I, too, love all the architectural details of an older home, and this one has many to salivate over.